The Milwaukee HD18 CS Circular Saw has a powerful 3,500/min motor that easily cuts most timber construction materials. It has a large 50 degree bevel facility. It has magnesium upper and lower guards to provide excellent impact resistance. REDLINK™ overload protection electronics in the tool and battery pack deliver excellent system durability. The circular saw gives excellent visibility of cutting line. 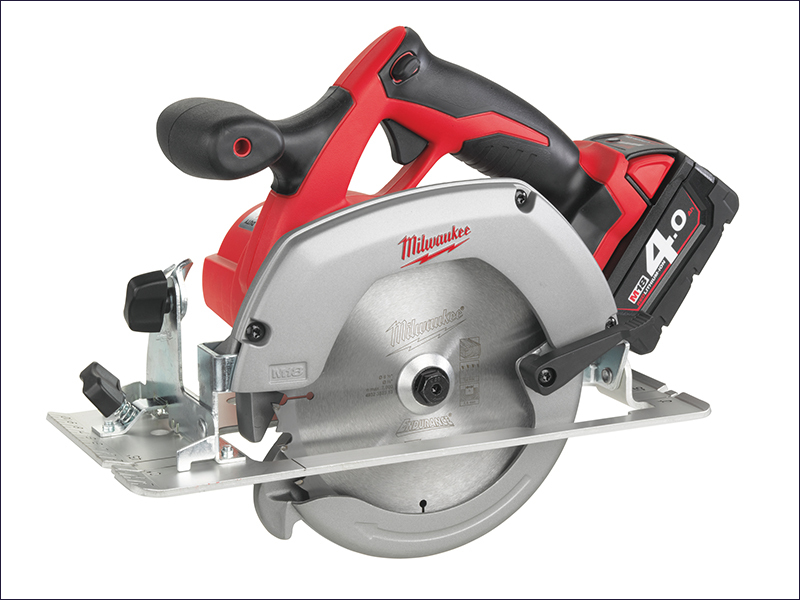 For safety, it has an electronic motor brake, meaning the saw blade stops within seconds. The ergonomic soft-grip handle provides comfort and balance for superior control. Supplied with 24 tooth saw blade, parallel guide, dust port and allen key. Max cutting depth 90°: 55mm. Max cutting depth 45°: 39mm. 2 x 4.0Ah Li-Ion batteries included.